See the whole series on Coralie Bickford-Smith’s website. Yes, another Penguin collection. I just love them all. I’m not going to bother espousing the virtues of making books collector’s items again (I think we’ve heard enough of that from me for now) but I am going to use these books as an example of returning to the retro in book design. There’s a real trend to bring back retro or old-fashioned covers and I think that this is, in a way, a response to the increasing presence of ebooks on the book market: the one thing that paper books have over ebooks is the nostalgia aspect (‘Oh but a screen will never look, smell, feel like a real book!’), so designing books to elicit all those nostalgic sentiments is a great way of emphasising their point of difference from their more techy counterparts. It focuses on the perceived advantages of pbooks over ebooks! Plus I’m a total sucker for these covers. They’ve got all that creepy, tacky feel of old-fashioned horror. And, they use the whole bright colour plus black and white principle I’ve been harping on about. So they tick all my boxes: collection, cover, retro. Yes! Read about the redesign of Ian Fleming’s Bond series on The Penguin Blog. Read about Michael Gillette’s design of Ian Fleming’s James Bond Series on the Penguin Blog. Visit Michael Gillette’s blog, Pencil Squeezing, to see more of his designs and artwork. I’ve already talked about creating a ‘collection’ through design and how I think this is a really effective tactic: it makes people want to own multiple books, rather than just one. This re-design of Ian Fleming’s James Bond series is a great example of repackaging an existing book and making it new or giving it a new appeal. The cover illustrations are great, and I’ve already talked about how I like the Bond Girl silhouettes on the spines (so cool), and I really think including the Penguin logo in the 007 on each cover is super cute. The books have a definite retro Bond feel that I think people are really into now and the covers aren’t simply good design, they’re actually cover ‘art’. 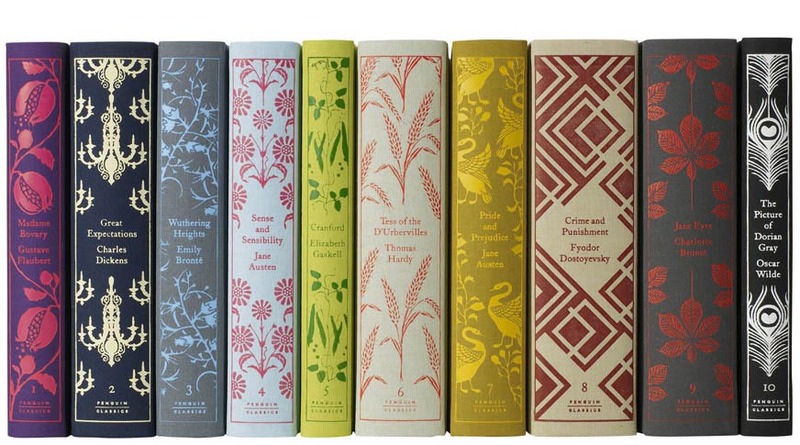 I can totally imagine buying one and then all of these books, just for their design. See more of Coralie-Bickford Smith’s designs for Penguin on her website. Read about Michael Gillette’s design of Ian Fleming’s James Bond Series on the Penguin Blog. See more of Emma J Wallace’s Future Classics designs on the Faceout Books website. The saying goes that we judge a book by its cover, but it’s fair to say we judge it by its spine before that. The spine is, after all, the first part of a book that we see before taking it off a bookshelf. And, while we may come across books discarded cover-up on a desk or a coffee table, when we’re buying them we’re generally going to be viewing them spine-first. These are just some of my favourite spines. I love what Coralie Bickford-Smith has done with the clothbound Penguins. They’re all about collection, and looking pretty on the shelf. I like the way pattern is incorporated so that it features more strongly than the text (which, interestingly for a spine, is horizontal). I like the Bond series because of the little silhouettes at the end of each spine – they’re so Bond and such a great detail! The New Classics are ones that caught my eye because they’re such a simple design (the brown paper thing is great). Each spine has a ‘personality’ and they also fit really well together. This cover is another example of one that has no title or author and that uses instead a quote as the typographic element. It’s a very clean and simple design and I especially like the hyphenation of ‘extraordinary’ which not only avoids an unbalanced look but also emphasises the ‘extra-‘ part of the word. 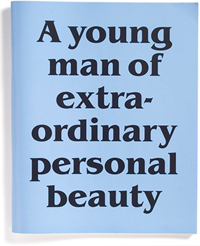 Looking at this cover, I can almost hear someone saying in an old-fashioned English accent ‘extraordinary personal beauty’. I think it’s an excellent use of typography, expressing a huge amount with apparently little (just words and a blue background). Where you’d find the magazine-like layout which I love! In terms of readability, I don’t know how great the layout would be (I can imagine getting a bit annoyed and losing the thread between pulled-out quotes and jumping from columns to no columns) but, my, does it look cool. I think it’s a great example of a classic book being repackaged in a way that makes it something new and different: it’s not just Oscar Wilde’s novel Dorian Gray, it’s the story reinterpreted and articulated by the designer (in this case, John Morgan for Four Corners Books). I think what’s neat about it is the way the internal design is commenting on the content. Read about this design at Greater Than or Equal To and at The Book Design Review. See another recent design of the 1984 cover here and read about it at The Book Cover Archive and The Penguin Blog. 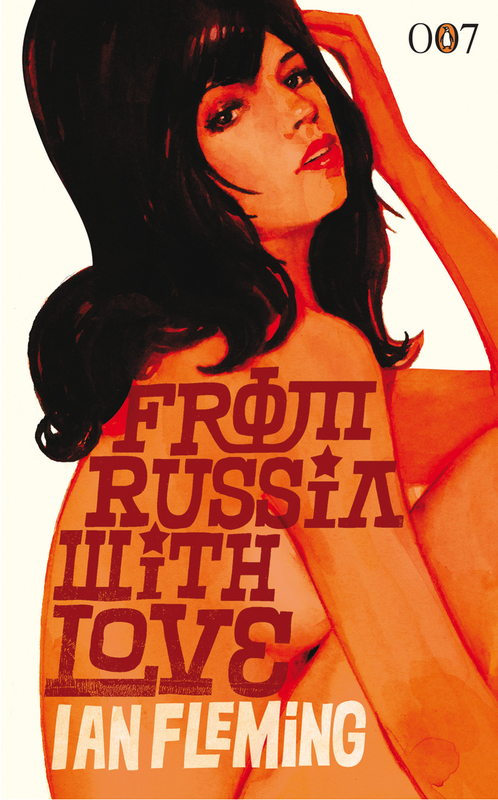 This cover, designed for Penguin by gray318, stood out to me for two reasons. 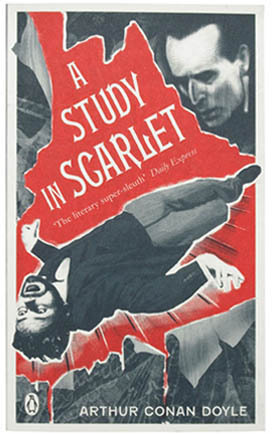 The first was because of the limited but bold use of colour: I notice that a lot of effective and eye-catching covers employ only one colour plus black and white and I thought this cover was a particularly good example of such use. I think red works really well as the extra colour. It’s bright, and it’s emotive. I know that it’s a colour combination I’m drawn to, and I’m guessing because of the prevalence of its use, it’s a combination a lot of people are drawn to as well. The second reason I found this cover of interest in terms of design was the fact that its text is a quote, rather than the title of the book or the author. This prompted me to ask myself: how well known does a book have to be before you can do a cover of it without its title or even its author on it? 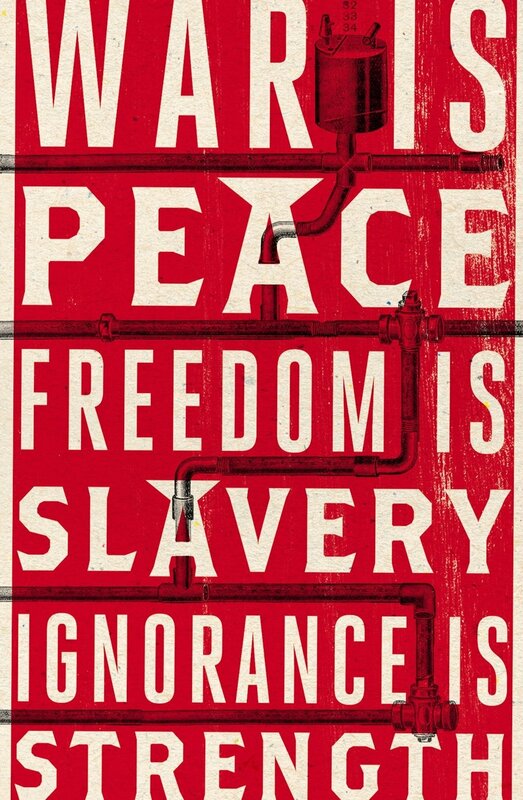 And is leaving off a title and author as well known as Orwell and Nineteen Eighty-four taking too much of a risk? Are they what are going to sell the book, or are people looking for a new twist on a classic? Personally, I love this cover. I love that it’s taking a risk. I feel like it’s saying more about the book inside than it could have done if it had the title emblazoned across the front. I feel like it’s offering a fresh perspective on something I’ve already seen a hundred times. And, given the comments on the links I’ve included, I think most people would agree with me. I’m also a fan of the end papers. Again, it’s the detail. I like seeing space used in a way that reinforces the book as an object as well as a story.